Fill a fryer or deep pot halfway with oil. Heat to 350 degrees F.
Sprinkle the turkey nuggets liberally with salt, pepper, powdered garlic, and basil. Next sprinkle the turkey nuggets with a dash of paprika and cayenne pepper. In a gallon size Ziploc© bag combine the flour and the cornmeal. Add the nuggets to the Ziploc© bag, close, then shake to cover the nuggets with the flour mixture. Remove the nuggets from the bag. Using a slotted spoon place the nuggets in the fryer. Deep fry for approximately 8 to 10 minutes until done. Serve with baked potato or corn on the cob and a fresh green salad! Marinate the turkey nuggets in your favorite BBQ sauce for a minimum of 30 minutes before breading (Grant likes a mustard base!). If you like a heavier breading, add 1 egg and ½ cup milk to the flour mixture (it should be roughly the consistency of pancake batter). If using it for cooking fish I recommend Old Bay or a cajun seasoning to replace the garlic and basil. 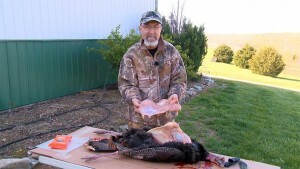 Remove the meat to a cutting board and coarsely chop. If you like “wet” BBQ slowly add and stir the cooking liquid into the chopped meat suitable to your preference. If you like a stronger BBQ flavor, add bottled BBQ sauce to the chopped meat. 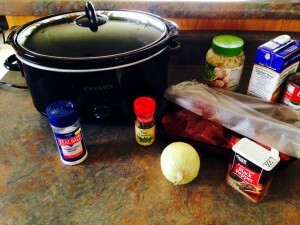 Easy bonus meal: Make a BBQ soup from the remaining “broth” in the Crock-Pot. Add whatever veggies you want to the base to make your own tasty soup! I usually add a bag of frozen mixed vegetables, 1/2 cup frozen diced onion, 2-3 14.5 oz. 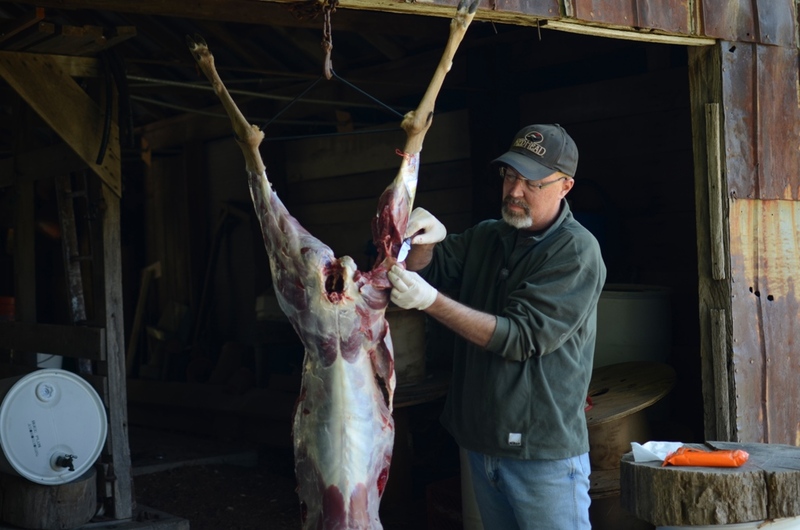 can broth, 2-3 can diced tomatoes, a 1/2 tsp of garlic powder and 1 cup chopped venison. Cook until the vegetables are tender. 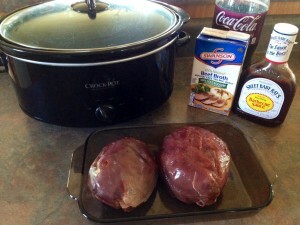 Place venison roast in lightly oiled slow cooker/crock pot. Add remaining ingredients. If there isn’t enough liquid to cover the roast, add water or additional broth. Cook on low for 8 to 10 hours. Remove and discard the bay leaves before serving. Note: You can easily add sliced carrots and potatoes on top of the roast to cook along with the meat. If you do this – drizzle a little olive oil on them along with a light sprinkle of salt, pepper, and very light sprinkle of garlic powder. 2. Lemon Pepper Seasoning, 1 tsp. 8. Salt (optional), ½ tsp. 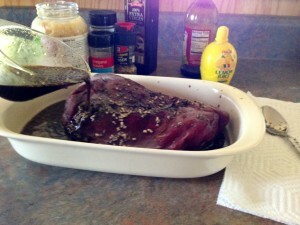 Marinate the meat for 24 to 36 hours in the refrigerator, turning the meat several times during the process. Broil the marinated loin in the oven or grill it over a low flame. 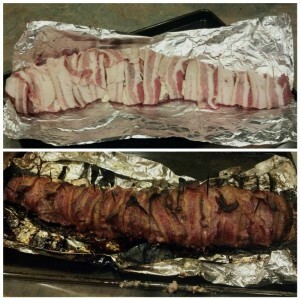 Let the meat rest for five to ten minutes before slicing. Note: This is a basic recipe. I have added things to it and taken some away over the years to arrive at the right combination. Do your own trial and error to see what you like. I really enjoy antlers. I think this is natural. The number of antlers painted on caves, cliffs, etc., around the world seems to support that man has always enjoyed antlers!